The powerful stage play "Blood Gets In Your Eyes", with its awe-inspiring speed and entertainment value, breathed new life into tradition-bound theatrical experience. 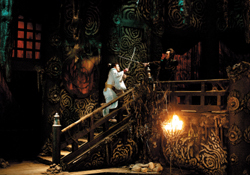 Staged in the summer of 2000, this first collaboration between Shochiku and the 'Shinkansen' theatrical troupe brought an immediate reaction among live-theater fans, and was revived in 2003. Hailed as a masterpiece in the theatrical world, this great work steps forth in April, 2005 as a feature film. 17th century Japan - it is late Edo period. The city of Edo appears calm, but down below, a string of ghastly incidents is shaking the town. The demons, usually out of the human eye, are on the rampage. The cause is a rumor among them that Ashura, a legendary devil queen, has returned: "If Ashura is back, then this world can all be ours!" To crack the ambition of the devils, the shogunate sets up a secret anti-devil agency Onimikado to fight the threat. The most talented agent at Onimikado was Izumo, who was known by the name of "Demon Slayer". However, he had laid down his sword after an incident one day, and is now an actor in a traveling troupe. When Izumo has a fateful encounter with Tsubaki, the beautiful leader of a band of thieves, the wheel of tragedy inevitably starts to turn. Tsubaki soon realizes her fate to turn into Ashura the moment she truly falls in love with a man.